DEIBUK, V. , BILOSHYTSKYI, A. Methods of quantum/reversible logic synthesis are based on the use of the binary nature of quantum computing. However, multiple-valued logic is a promising choice for future quantum computer technology due to a number of advantages over binary circuits. In this paper we have developed a synthesis of ternary reversible circuits based on Muthukrishnan-Stroud gates using a genetic algorithm. The method of coding chromosome is presented, and well-grounded choice of algorithm parameters allowed obtaining better circuit schemes of one- and n-qutrit ternary comparators compared with other methods. These parameters are quantum cost of received reversible devices, delay time and number of constant input (ancilla) lines. Proposed implementation of the genetic algorithm has led to reducing of the device delay time and the number of ancilla qutrits to 1 and 2n-1 for one- and n-qutrits full comparators, respectively. For designing of n-qutrit comparator we have introduced a complementary device which compares output functions of 1-qutrit comparators. M. Nielsen, I. Chuang. Quantum Computation and Quantum Information. Cambridge University Press, 2010. A. De Vos, M. Bose, S.D. 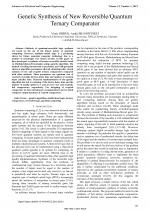 Baerdemacker, "Reversible computation, quantum computation, and computer architectures in between", J. Multiple-Valued Logic and Soft Comput., vol. 18, no. 1, pp. 67-81, 2012. A. Muthukrishnan, C. R. Stroud, Jr., "Multivalued logic gates for quantum computation," Physical Review A, vol. 62, no. 5, pp. 052309/1-8, 2000. A. B. Klimov, R. Guzman, J. C. Retamal, C. Saavedra, "Qutrit quantum computer with trapped ions," Physical Review A, vol. 67, no. 6, 062313/1-7, 2003. D. McHugh, J. Twamley, "Trapped-ion qutrit spin molecule quantum computer", New J. Physics, vol. 7, No. 1, pp. 174/1-9,2005. V. G. Deibuk. I.M. Yuriychuk, R.I. Yuriychuk, "Spin model of full adder on Peres gates," Int. J. Computing, vol. 11, no. 3, pp. 282-292, 2012. D. M. Miller, M. A. Thornton. Multiple Valued Logic: Concepts and Representations. Morgan & Claypool Publishers, 2008. M. Lukac, M. Perkowski, H. Goi, M. Pivtoraiko, C. H. Yu, K. Chung, H. Jee, B-G. Kim, Y-D. Kim, "Evolutionary approach to Quantum and Reversible Circuits synthesis," Artificial Intelligence Review, vol. 20, no. 3-4, pp. 361-417, 2003. D. M. Miller, D. Maslov, G. W. Dueck, "Synthesis of quantum multiple-valued circuits", J. Multiple-Valued Logic and Soft Comput., vol. 12, no. 5-6, pp. 431-450, 2006. D. M. Miller, R. Wille, R. Drechsler, "Reducing reversible circuit cost by adding lines", J. Multiple-Valued Logic and Soft Comput., vol. 19, no. 1-3, pp. 185-201, 2012. M. Lukac M. Perkowski and M. Kameyama, "Evolutionary quantum logic synthesis of boolean reversible logic circuits embedded in ternary quantum space using structural restrictions", in Proc. IEEE Congress on Evolutionary Computation (CEC 2010), Barcelona, Spain, 18-23 July 2010, pp. 1-8. M. H. A. Khan, M. A. Perkowski, M. R. Khan, and P. Kerntopf, "Ternary GFSOP minimization using Kronecker Decision Diagrams and their synthesis with quantum cascades," J. Multiple-Valued Logic and Soft Comput., vol. 11, no. 5-6, pp. 567-602, 2005. R. Khanom, T. Kamal, M. H. A. Khan, "Genetic algorithm based synthesis of ternary reversible / quantum circuits," in Proc. 11th IEEE Int. Conf. on Computer and Information Technology (ICCIT 2008), Khulna, Bangladesh, 25-27 December, 2008, pp. 270-275. X. Li, G. Yang, D. Zheng, "Logic synthesis of ternary quantum circuits with minimal qutrits," J. of Computers, vol. 8, no. 8, pp. 1941-1946, 2013. Y.-M. Di, and H.-R. Wie, "Synthesis of multivalued quantum logic circuits by elementary gates," Physical Review A, vol. 87, no. 1, pp. 012325/1-8, 2013. S. B. Mandal, A. Chakrabarti and S. Sur-Kolay, "Quantum Ternary Circuit Synthesis Using Projection Operations," J. Multiple-Valued Logic and Soft Comput., vol. 24, no. 1-4, pp. 73-92, 2015. K. Fazel, M. A. Thornton, and J. E. Rice, "ESOP-based Toffoli gate cascade generation," in Proc. IEEE Pacific Rim Conference on Communications, Computers and Signal Processing, (PacRim,2007), Victoria, Canada, 22-24 August, 2007, pp. 206-209. R. S. Zebulum, M. C. Pachecco, M. M. Vellasco. Evolutionary Electronics: Automatic Design of Electronic Circuits and Systems by Genetic Algorithms. CRC Press, 2002. L. Spector. Automatic Quantum Computer Programming: A Genetic Programming Approach. Kluwer Academic Publishers, 2004. A. E. Eiben, J. E. Smith. Introduction to Evolutionary Computing. Springer-Verlag, 2013. M. H. A. Khan, "Design of reversible/quantum ternary comparator circuits," Engineering Letters, vol. 16, no. 2, pp. 178-164, 2008. R. P. Zadeh, M. Haghparast, "A new reversible/quantum ternary comparator," Australian J. Basic and Applied Sciences, vol. 5, no. 12, pp. 2348-2355, 2011. D. Mukherjee, A. Chakrabarti, D. Bhattacherjee, "Synthesis of quantum circuits using genetic algorithm," Intern. 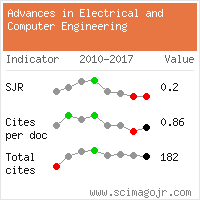 J. of Recent Trends in Engineering, vol. 2, no. 1, pp. 212-216, 2009. A.I. Khan, N. Nusrat, S.M. Khan, M. Hasan, M.H.A. Khan, "Quantum realization of some ternary circuits using Muthukrishnan-Stroud gates," in Proc. 37th Intern. Symposium on Multiple-Valued Logic, (ISMVL,2007), Oslo, Norway, 13-16 May 2007, pp. 20. R. Wille, R. Drechsler. Toward a Design Flow for Reversible Logic. Springer Science+Business Media B.V., 2010. M. Lukac, M. Kameyama, M. D. Miller, M. Perkowski, "High speed genetic algorithms in quantum logic synthesis: Low level parallelization vs. representation," J. Multiple-Valued Logic and Soft Comput., vol. 20, no. 1-2, pp. 89-120, 2013. V. Deibuk, I. Grytsku, "Optimal synthesis of reversible quantum adders using genetic algorithm," Int. J. Computing, vol. 12, no. 1, pp. 32-41, 2013. F. Z. Hadjam, C. Moraga, "RIMEP2: Evolutionary design of reversible digital circuits," ACM J, on Emerging Technologies in Computing Systems, vol. 11, no. 3, pp. 2348-2355, 2014. K. Datta, I. Sengupta, H. Rahaman, and R. Drechsler, "An evolutionary approach to reversible logic synthesis using output permutation," in Proc. IEEE Design and Test Symposium (IDT), Doha, Qatar, 16-18 Dec. 2013, pp. 1-6. J. Jegier, P. Kerntopf, M. Szyprowski, "An approach to constructing reversible multi-qubit benchmarks with provably minimal implementations," in Proc. 13th IEEE Conference on Nanotechnology (IEEE-NANO,2013), Beijing, China, 5-8 Aug. 2013, pp. 99-104. Citations for references updated on 2019-04-21 22:40 in 85 seconds.